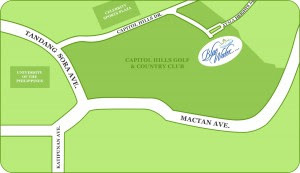 BlueWater Day Spa has just recently opened a branch at Capitol Hills Golf Club, amidst the exclusive villages and the golf course. It features great views as well as BlueWater's trademark of well-thought of facilities like the Spa Home Theater system. I'm guessing golfers who have sweat it out at the nearby golf course will love getting pampered there by getting foot scrubs together while talking about the highlights of their recent game. But one other thing I think nearby establishments can do is team up with BlueWater Day Spa and give out spa certificates as prizes. It's a cheaper but equally wonderful incentive to give out to employees of the country and golf clubs. Say, no tardy episodes for an entire month will entitle you to a foot massage. And if you accummulate your "points" for three months, then you'll be entitled to something more luxe at the spa. Spa certificates can also be given as prizes in the golf tournaments. Nothing like a good facial to go along with your retelling of your win and the showcasing of your trophy. Mommies can also treat their local day care and preschool teachers to a day at the spa as a reward for stimulating and caring for their kids while these precious ones aren't home. And now, they're giving 20 bloggers a chance to enjoy the luxuriousness of their spa. Check out their contest which runs till April 21, 2009 only.